Holy Moses, I just found myself looking at a photo of one of Australia’s ex-prime ministers, and it took me a good 30 seconds to retrieve his name from the diabolically disorganised data filing system in my head. I have no idea who’s doing the sorting up there, but I think they’ve gone AWOL. I’ve always been paranoid that my brain cells are diminishing at a rapid pace, and it amuses me when my 95-year-old grandpa tells me stories of standing up to do something, before forgetting what he stood up to do. Geez grandpa, this is old news for me, I started doing that ten years ago. I even went to my doctor about a year back to ask if he thought I might have an early onset of Alzheimer’s. He’s known me for a while, especially my hypochondriac behaviours, so he took my question seriously and ran me through 30 questions beginning with the date, where I was etc etc. He then moved onto remembering three different articles that I had to repeat at the end, writing something on a piece of paper and folding it in half (or something like that – of course I can’t exactly remember) and around 20 others basic tasks. At the end he told me I’d answered all the questions correctly and was the fastest person he’d known to do so. But why then did I just stare at a photo of John Howard and take so long to remember his name? The better question may be, why was I staring at a photo of John Howard, but honestly I feel like my brain is behaving the way my computer does when the start up disk becomes full. I don’t even know exactly what this means, but programs start shutting down unexpectedly, documents take a while to open, I have to click on things twice just to make something happen. This stuff is happening in my head. I’m reacting more slowly, words take longer to formulate, and god help me if I have to remember someone’s name that I haven’t seen in a long time. There’s too much in there and I need to create space. I haven’t been exercising my brain muscles enough so they’re losing their strength. If it’s an issue of the first instance – how does one create more space? I don’t have a USB port by the side of my temple I can download from. And if I did, my filing system would probably be as bad as the one I keep for my regular documentation. Is there such thing as a mental reboot, a defrag for our brains that doesn’t cause us to lose important data? If it’s an issue of the second instance I kind of get it. I haven’t utilised the tactical side of my brain for a while. I could literally go to work in a semiconscious state and still perform the majority of my duties to their desired capacity. But is this really making a difference? I have mastered the art of remembering the model, style and location of four different shoes at a time. The problem is sometimes when I come out to deliver them, I can’t for the life of me remember who they were for. I’ve literally stood on the floor with a perplexed expression for 15 seconds until the person grabbed the shoes themselves, or at least waved me over. I have terrible facial recognition. My most feared question in the world is, “have you guys met?” I always wait for the other person to respond, and if there’s any hint of deliberation, I always lean to the affirmative response. My best friend Penny in Melbourne, who has known me since childhood, is so aware of my failing memory that she provides me with a full briefing before we catch up with old friends. These are people I’ve known for years, but I did at one point forget that Kass was pregnant, and if Jules hadn’t broken up with her boyfriend I wouldn’t have remembered his name. I know this doesn’t sound that drastic, but trust me it’s gotten bad. My worst nightmare would be attending a school reunion. Throw me into a tank of sharks any day. I’d be more out of depth making idle chitchat with absolute strangers I supposedly knew than taking my chances with those giant fish. I’ve often been told the way to keep my brain active is by doing puzzles like Sudoku or crosswords. I know there’s also memory exercises one can adopt that use visual stimuli to enable one to recollect incredible amounts of data. But I always forget to do them, or at least that’s my excuse. I’m certainly open to suggestions, but felt compelled to share my experience so that my 95-year-old grandpa and anyone else who stands up and forgets what they’re doing can put their mind at ease. It happens to the best of us! 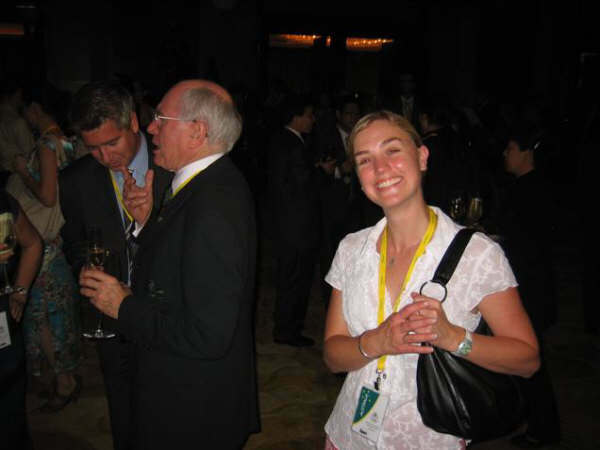 Posing beside John Howard, Australia’s second longest-serving Prime Minister, after sneaking into the Australian Athlete’s Welcome Reception with my sister and brother-in-law at the Beijing Olympics, 2008. In my humble opinion, you are searching for something and it’s much more than just a story to tell. But whatever it is, it’s going to be a hell of a story when you do find it. I’m intrigued by your opinion! And am as eager to find out as you are! Thanks Carl! Thank you Huub! I will have to translate the article and let you know what I think. I wish my Dutch was much better! I agree with your opinion, I just wish my brain would prioritise more! Love to you and the rest of the family!! Okay, I have the same issues (think we all do, more or less), and have been pondering it for some time (years). Same as you, I immediately thought it had to be early onset of Alzheimer’s. Same conclusions though…ie too much in the head, poorly organized filing system, etc. have noted it’s worse when a) i’m overtired, b) mind is really focusing on problem in the background (using too much ROM) and I’m trying to hold surface conversations…and not able to pull enough resources into the effort. c) something im really not too interested in filing away correctly…like politicians names….what’s the name of that vice-president again..hmmm. I think I’ve decided it’s a good thing…in that it’s a protective measure keeping me from pure “china syndrome” brain meltdown…Of course that’s just my opinion…your mileage may vary! Oh, and hi again! have been busy on secret projects and not keeping up with your always fascinating explorations into the meaning of….hmm meaning. Haha well it’s been changing hands so frequently I’m not that surprised people aren’t keeping up! Thanks for the comment. I hope life is treating you well in beautiful Tasmania! It has been a bit confusing but I only moved from Canberra to Tassie earlier in the year so perhaps I just have more of a finger on the pulse (pardon the pun) than the locals despite not being Australian (well technically I am Australian too since July). Tassie is a beautiful place and I’m really enjoying it and living somewhere much nicer and rural than I could ever afford in Canberra. Having said that Canberra is a brilliant place to live and I do rather miss it. That’s great to hear you’re considering hiking the trail!! You’ll certainly find a lot of answers there, not necessarily the ones you’re looking for, or thought you were looking for but still. Living 5-6 months with a very distinct and basic purpose is why I believe thru-hiking can become so addictive. Plus being outdoors and in nature for that long does amazing things to the soul. I’m reading an interesting novel that was recommended to me called Man’s Search for Meaning at the moment. You might enjoy it too! The thought of a few months off just hiking sounds like bliss, I’ve done some long trails (the southern half of the Bibbulmun and the northern half of the Israel National Trail) and did the Larapinta (again) this winter but the longest so far has been the Camino Francés. I’m planning to do the PCT, AT and CDT but it’ll take me a few years to get round to finding time to do all three, unless I win the lotto this weekend. I’ve heard (read) you rattle off numerous town stops and info regarding PCT questions as if you were there yesterday. Those times and memories are burned into your mind and body and represent the part of our lives that is not the normal routine. The interesting thing about being a serial nomad is that the daily mundane routine represents a smaller percentage of your life than most. So unless something or someone REALLY stands out, they or it won’t be remembered as easily. I remember stories from decades ago that my kids remind me I’ve told many times already. No problem remembering the story but I just can’t remember standing up to retell it. I know I’m not alone, my dad did it to me. I enjoyed your computer analogy. Just keep journaling and photographing, and you’ll be alright. Just don’t forget where you keep them. Hi Rozanne. Been following your blogs for a while now and am enjoying them immensely. Just to refresh your mind, I am your cousin, you know, one of those Dutch family members :-). I’d love to invite you to stay with us in Johannesburg, to expose you to a whole load of experiences to feed your blogs for the coming years. But, until we get to such an event I’d recommend you not to get pregnant to prevent further brain issues. Pregnant women have been known to leave mobile phones in the fridge to name but one example of temporary memory loss (this turns into permanent loss once child is born). Keep up the great postings! While I had my dad at his hearing aid place, one of the techs working there told me that in order to keep the brain stimulated, you should read/speak out loud – especially reading out loud. I was really surprised about how much slower I read while trying to do this, but I have gotten much quicker. Also – absolutely love crosswords. My mom taught me how to work them – lots of fun. Hmm that’s interesting! When I proof read my own writing I often read it aloud because like you, it slows me down enough to catch most errors. I didn’t realise it was having the added effect of stimulating my brain! Thanks for the insight!! Hi Rozanne…..I was writing a reply to your blog and suddenly I accidently (sp?) turned the screen on its side….giggle…..so, I lost the message….I guess you are giggling when I say that can’t remember what I wrote….so, see, I forget also…BUT, shoot, I have a pretty old brain..so it isn’t surprising…. I do remember forgetting stuff when I was a younger soul….and, I get it when you worry about it….don’t worry, sweetie, you are a human after all is said, done, or worried about…. Also, you have had so many remarkable experiences in your life…so, I am not surprised you often muse about your life here on this beautiful planet….and, those experiences are alive in your mind…kinda keeping you yearning for more and more adventures. Honestly, I have always had that restless feeling…keeping me being like a pilgrim….moving on and fighting for a new way of being….and thinking and challenging things that I really feel aught not to be as it is…does that make any sense…maybe it’s a sense of wanting more justice to be here on earth…for all….and here is where I am right now…. I am no longer willing to be ONE of THOSE that I was because I lived all of my life at 35 years and on until age 75 worrying about anyone finding out how I had fallen in love with a woman…I was married, had 4 kids, teaching in Christian school…living a double life, for sure…which, by the way made my feel crazy and want to take my own life….I was GUILTY….and knew that I would be condemned by many in the church at large…. And I am studying the history of Jesus, the man, the peasant of Jerusalem who was murdered for his fight against injustice for his peasant people who were living under the rule of Ceasar and of the Jewess religions of that culture…oppressive and unjust…I realized that I have many questions about all this happening down through the ages that has brought such harm to so many in the name of that same peasant mystic….His message was the compassion of a God who cared. Barbie, wow what a story!! My phone has been playing up so when I first received this message it wouldn’t let me scroll down. I was rushing to get somewhere and forgot to look back at it until now. Thank you for being so open and for giving us such insight into your fascinating life. You have a remarkable story to tell, and allow others in similar situations to realise they’re not alone in their own struggles. I hope that you write more of it down so us vagabonds can learn from your discoveries and experiences. You’ve packed a lot into your lifetime already, so I would be surprised if your memory wasn’t just a little hazy. It seems to be common amongst all ages! Hi Sweetness…..My last paragraph didn’t get finished….I guess this WordPress causes you stop after a such a long epistle….smiling….I think I wanted to say the historic Jesus was a revolutionary person who I can see really did show us that life can be really great….I am not sure he was a Christ…a messiah….so I have really had to let NOT KNOWING be a part of my thinking…so to have a mind challenged is really difficult….at least my brain says that it is good to be tweeked….giggle…. It would be an absolutely fascinating and riveting story. I hope I get the chance to meet you face to face and uncover some of these stories for myself!! Hi Rozanne….I have been thinking about you lately and wondering how you are doing….it’s been awhile and maybe I missed a blog that may have done since this one….How are you doing….hope all is well with you and you are somewhere having an adventure….not that working might have some adventure in it….smiling…. About my story….this year, 2016, I made a promise to my niece that I would write the story….She let me know that it would be gift and legacy if I wrote it for the family….so, it is the beginning of March, 2016, and I need to get going….guess I am afraid that I can really do it…maybe, that’s the reason I haven’t started…. I will do it soon…. Barbie I’m so excited to hear that you’ve decided to put pen to paper to document your life story. What an exciting prospect!! The hardest part is starting, so don’t put it off any longer, just begin writing and see what happens, you will have plenty of opportunities to edit along the way. Find one person with strong language skills that you trust and feed parts of the story to them as you go. Writing can be a very lonely experience without someone to bounce ideas off! I’m truly happy for you and will be thinking of you along this new journey! Keep me up to date with how you’re doing!! I will try my best to get my self going on the story….I do have a great friend that wants to help me with it….YES! !….so I am now more motivated than ever…and with your interest and care to hear the story, it really gets me going…. Another adventure….one that is pretty frightening for me, for sure…because my future is so unsure….he is 89yrs old and doesn’t want to do anything that will make him sick..and I don’t blame….BTW, I was 22 years old and he was 29 when we married….lots of years….and I can’t believe we have stayed together this long…and we both shake our heads thinking about it….smiling….having a pretty good attitudes about all of these happenings helps alot for both of us…our kids, my two daughters and two sons are doing pretty well also…so that is very helpful…. Thanks, Sweetie….will let you know as we find out….